In honor of 25 years in the pony-tunin' business and 45 years of Mustangs, Steve Saleen's new company has created the 2010 SMS 460 Mustang and, surprise, the SMS 460X. 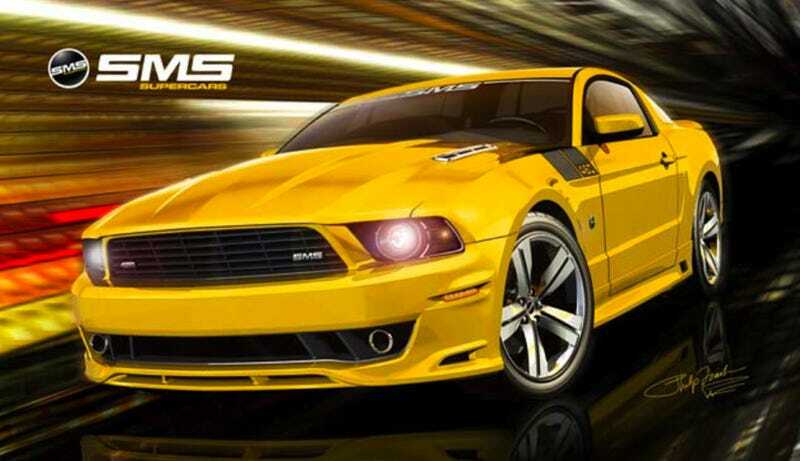 The 2010 SMS 460 Mustang is the more pedestrian of the two 2010 Mustangs, offering 470 HP and 427 lb-ft of torque. For real power, you'll want the SMS 460X and its supercharged V8 pumping out a mean 655 HP and 600 lb-ft of torque. The 460 grabs a five-speed automatic or manual, while the SMX gets a six-speed SMST manual. No hard numbers out, but expect low 4's from the former and "even lower" 4's from the SMSX. In addition to the power, the Saleen Stangs get the golden touch on the outside and inside. From this drawing it certainly looks like a Saleen. and SMS 460X Mustangs at the 45th Anniversary Celebrations in Birmingham, Alabama. Instantly recognizable as Steve Saleen's work, the new SMS 460 Mustangs feature a host of visual and technical highlights that set them apart from the crowd. last year," says SMS Supercars CEO and President Steve Saleen. version of this American favorite." a 6-speed SMST manual on the top of the line 460X. high-quality leather. Multiple seat chevron and SMS unique exterior colors are available.